The hospitals for Sydney’s children have been housed in a number of locations since settlement. The Glebe Sydney Hospital for Sick Children was established in 1880 in premises on the corner of Glebe Point Rd and Wigram Rd (first built as a school, but mostly since demolished and now a park and library). Local identities, who were instrumental in establishing the Glebe site as hospitals, relied on public subscription and fund raising. Lady George Wigram Allen of Toxteth Park was Vice President of the Board of Management (1880-1895) and her husband Sir George, President (1880-1885). Members of the Wilkinson family of Hereford House (now Foley Park) were also early board members. Diphtheria was a disease feared in the Victorian era for being highly contagious and often fatal. Separate accommodation was usually built to house diphtheria patients. Initially children were treated in a four bed ward at the back of the children’s hospital but this was regarded as not large enough and inadequate for isolation. In 1829 Kew Cottage had been built by merchant John Betts directly opposite the hospital. This single storey house sat well back from the road on a large block of land which extended as far down as the Blackwattle Bay shore line. By the 1890s the house belonged to his daughter Miss Harriot Betts. Miss Betts was another local identity and was a staunch supporter of St John’s Church. The family had donated the organ, font and reredos. Diphtheria Cottage (Image taken from Hipsley 1952). In 1892 the board realised demands for beds could not be met and began to look for new accommodation close by. Due to the fear this disease engendered locals were against acquiring Kew Cottage across the road and petitioned the Minister for Health to overturn the decision even though the current four-bed ward potentially posed a bigger risk. The house was secured despite community consternation. The hospital was opened with 12 beds in 1893. An interesting aside is that garbage was buried in the grounds as the garbage collectors refused to take the contaminated rubbish! By the early 1890s anti-toxin treatments for diphtheria were developed in Germany and from this decade mortality rates markedly decreased. The Annual Report from 1896 cites this great advance: “The death rate in the diphtheria wards has (thanks to the new anti-toxin treatment) been reduced to 24.1%”. Death rates had been double that in the past. 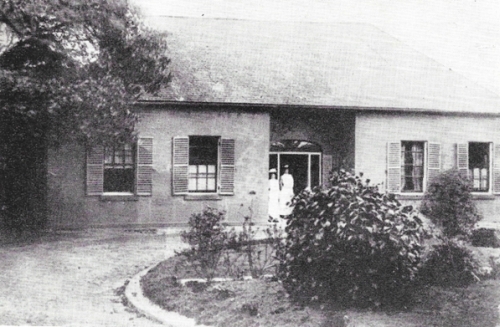 Diphtheria Cottage moved in 1907 with the old hospital to their new site in Pyrmont Bridge Rd Camperdown, now named The Royal Alexandra Hospital for Children. In the same year the house was torched in “the interests of public health” as residential use was not permitted. Surgeon Dr Clubbe, hospital staff and Glebe residents were invited to attend. Sister Layton, who had been sister in charge, declined the invitation as she felt much good work had been accomplished at the cottage and its demolition did not appeal to her. The land was then subdivided and sold for £3600. 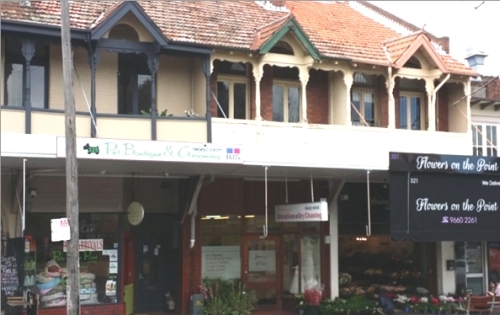 Edwardian shops and residences at numbers 321 to 327 Glebe Point Rd were then built on the front part of the block. Houses at the north end of an extended Lombard St were also built at this time. This was the inglorious end for another Glebe Point colonial house.